The article was originally published in the newspaper of the Extraordinary International Session of the EYP in Lillehammer. Picture by Sophie Debrunner Hall. The European Youth Parliament is a debating competition. That is, at least how it is presented to many schools at regional level in countries such as the United Kingdom and Belgium. Through official literature they are told that EYP gives students a chance to “debate current European and global issues”. This is obviously the case, but there is so much more in EYP. After the eight days in Lillehammer, only two days will have been spent debating. This raises the key question: how important debating really is in EYP? The General Assembly plays a crucial part in any session. 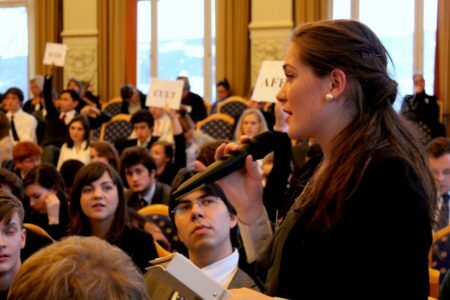 Regardless of at regional level or at an International Session, the hours that we spend debating resolutions are an integral part to what EYP is. It is here that the voices of the young people of Europe are heard. It is here that the democracy and freedom of speech which EYP hails to be its key reason of creation, is brought to the fore. There are few who can challenge this. There are few who would want to challenge this. Yet, I believe that despite playing an important part in any session, it is not the debating that makes EYP. questioned your resolution more than once or even asked yourselves ‘how on earth can I challenge that point’. Whatever battles you went through, all of you will leave the hall in Kulturhuset Banken with a greater sense of personal pride. In this respect, the benefits of the GA are significant and must be praised. However, this is not EYP. This may be the formal and needed face of EYP, but it is not the intrinsic self of what makes this organisation better than any other. There are countless debating competitions in every country across Europe. What makes EYP special is that when you leave, it will be the friends you have made that will remain on your mind. It is not about winning or losing that drives the ethos of EYP. Nothing symbolises this more than the fact that at every International Session, the very flagship events of which Lillehammer is one, there is no jury. There is no implementation of a meritocracy, but anoverriding emphasis on teamwork and cooperation. To attach the term “debating competition” does our organisation an injustice as we are profoundly better than this. It is not about competing with one another, which is essentially what debating is, but more about discussing and challenging one another so we can together create the best solutions. Delegates at forums gain and utilise all the skills which those at debating competitions use. The need for clear, cogent arguments is equally necessary in EYP. The importance of rebuttal and clarity of speech is also essential in the GA. Yet, I believe that these skills are best instilled into delegates when blended in with the fun and excitement of an EYP programme. The humour, fun and memories each committee creates in teambuilding fundamentally differs from ordinary “debating competitions”. This is why debating is not the heart of EYP. It is at the heart but not the heart. It is a subtle but profound distinction which characterises our ethos of working together to challenge and progress. There are sceptics amongst us who claim that the GA is a waste of time as the resolutions slaved over and contested are useless. I categorically disagree with such a view. Admittedly, it is unlikely that the resolutions you create will ever be implemented. Yet, this is not the reason why we create and discuss our resolutions. You will all no doubt, at some point have been silenced by another point of view. You will all have sat back and reflected upon your arguments and readjusted them based on the opinions of another and this is what is important. Listening to those around you at a session who have come from a completely different background and champion a completely different idea but listening and respecting them all the same. The EYP is a unique organisation. If you did not appreciate this before the session you will leave now knowing this. It is not special because we debated to win. It is not special because you came together and debated endlessly for self importance and victory over others. It is important because it gave you the opportunity to build and defend arguments created through teamwork, cooperation – and above all, fun.